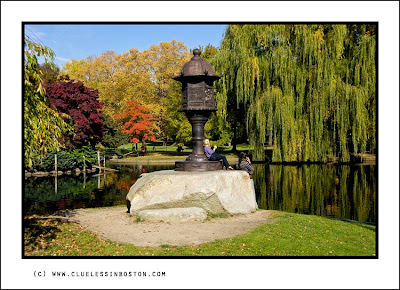 Japanese Lantern in the Public Garden. On my three day visit to Boston I found it a very relaxed city, this comes across in the shot of the park. I really like the reflection of the bright tree and the way the people are so small compared to the lantern. So lush and so peaceful. I love the quiet of a Japanese garden and presume this is one or at least it seems so. Love the Common and the Public Garden, so soothing to sit and enjoy the world swirling by. The balance on this shot couldn't be any more perfect. This is a gorgeous image. Picturesque! I see your colors are changing. I love fall! I enlarged this picture and I had a wonderful surprise!Those girls are a neat detail in this shot!So beautiful! I love japanese mood! This time you added a surprise: the lantern is so tall and the people so small, like in a fairy tale!And what Wonderful colors and great reflection of the trees behind..! That is so pretty! I like that how that tree is reflected in the water. Autumn lighr and autumn colours....splendid! What beautiful parks there are in Boston. I would like to be able to take a stroll here in my lunch break. Love the lantern, the background is perfect.